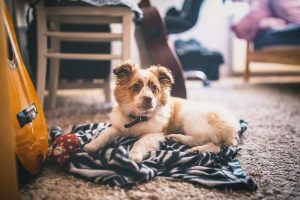 If your family includes a few furry pals, then you undoubtedly know how hard it can be to keep your home clean and your air quality high with these family members in the house. Your dogs, cats, rabbits, and other furry pals can add an incredible amount of joy to your life, but they can also add an incredible amount of allergens, dander, and dirt in your home. 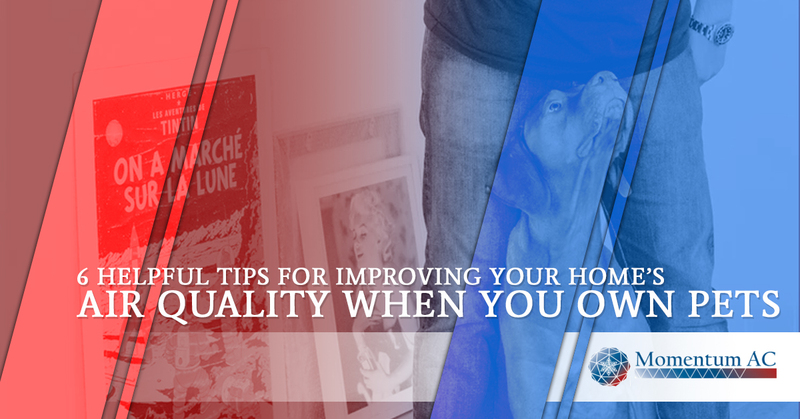 If you find that your home’s air quality is lacking, check out these six helpful tips for improving the air in your home. Reach out today to learn more about how our HVAC team at Momentum AC can help through a variety of tactics including air duct cleaning services in Tampa. The first thing you can do to cut down on how much fur, dander, and dust is present in your home is to ensure you are grooming your pets frequently. Even a short-haired dog can cause a lot of allergens to be present in your home. By either grooming your pet on your own or taking them to the local groomers, you can help lower the pollutants in your home’s air. Giving your pet a bath, brushing their fur frequently, and keeping their paws clean can go a long way in improving the air you breathe. Another way to ensure that your home’s air quality is the best it can be is to set up a daily cleaning routine. The reality is that when you live with pets, you will have more to clean. Dogs and cats can drag dirt in from outdoors and their shedding will leave even the most pristine of homes a mess. Make sure that every day you do basic cleaning, such as sweeping the floors, light vacuuming, and dusting. By keeping up with cleaning, you can prevent allergens from building up. Carpeting is one of the worst floorings to have when you own pets. If replacing your carpets with hard flooring types is possible, do so. However, if you love the soft feel of your carpet or you are in a situation where replacement isn’t an option, make sure you deep clean your carpets frequently. Either rent a carpet cleaner or hire a professional team a few times a year to rid your carpet of fur, dander, and dust. Replacing your HVAC filters will be a vital part of keeping allergens out of your home’s air. However, when you own pets, the cheapest air filter won’t do. Make sure you invest in HVAC filters that are specifically designed for homes with pets. If you aren’t sure which filter is best for your needs, talk to your local HVAC contractor and get advice on what to install. Another option for cutting down on the allergens in your home’s air is to purchase an air purifier. They come in a wide range of styles and sizes, so you can find something to meet your specific needs and budget. Whether you decide to purchase a small, stand-alone unit for just one room in your house or you want to upgrade your whole HVAC system to include a state-of-the-art purifier, these machines are an effective way to clean the air in your home. Air purifiers are particularly helpful for people who suffer from allergies or asthma. Finally, when pets live in your home, their fur, dander, and the dust from their coats can wind up in your air ducts. Rid your home of all these pollutants by scheduling duct cleaning services at least once a year. When an HVAC professional cleans your air ducts, you will find a vast improvement in the quality of the air being pushed throughout your home. Interested in duct cleaning services in Tampa? Please reach out to our team. We utilize the very best in air duct cleaning equipment to ensure we leave your home cleaner than when we arrived. Rid your air ducts of harmful pollutants and allergens by allowing our experts to clean your HVAC system thoroughly.